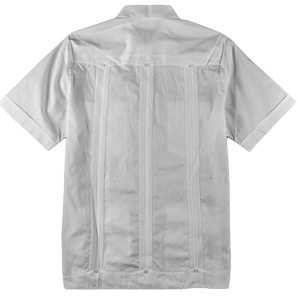 Traditional Guayabera style – This is the traditional guayabera shirt style with the four front pockets, pin-tucks front and back and decoration all around including the side slit. We ordered this shirt for a wedding – It is amazing and we could not be more pleased... was true to size ... Will work with them again. Cannot say enough good about the company and the product! 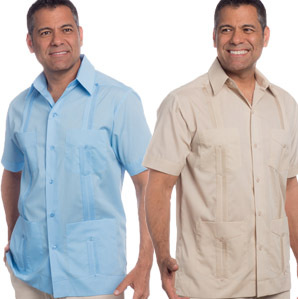 Most customers used this guayabera shirt at cruise attire, doing business in Cuba or Latin America, a night in Miami, Havana nights gala and uniforms. Purchased for my very picky boyfriend who lived the fit and quality of the shirt. This was purchased for an upcoming vacation it is a very nice quality, the stitching is all intact unlike other places we have tried and the price was very reasonable for the product received. Also I would like to mention the fit of the shirt is that of a traditional guayabera not a box shirt with 4 pockets. We will be ordering more! Shirt arrived on time and fits flawlessly. Looking forward to wearing it on a cruise to Cuba in March. I'm very satisfied with the shirt. It breaths well and and looks great without the wrinkling issue that wearing linen entails. This shirt is beautiful and it was delivered on time. The fit was true to size. Will purchase from this store again. Excellent buy runs slightly big, so order your normal size. Ordered the blended Guaybarra. It shipped and came in time for a planned beach wedding. However, it had a blemish, and had to be returned. That was no problem. Within an hour of explaining my situation, a new shirt was on the way. I was very skeptical, but, I said thanks, and sent my first shirt back right away. My second shirt arrived in time for the wedding. It was a great hit. Thanks from an old man. My daughter is having a "boho chic" wedding in a large backyard this summer. The groom is wearing casual attire and my husband was at a loss at what he should wear, then we found the Guyabera shirt. It's perfect! My original order had to be changed because I needed a different size. No worries! Not only was the exchange made without hitch but My Cuban Store also supplied the address label. Nice. The 2 guayaberas were very well made and very comfortable. I had bought 2 in Cuba in 2003 ($10 each!!) and the ones from MCS were at least as good if not better. The colors were a little different than expected (the beige could pass for yellow and the jade for turquoise) but still more than acceptable. On this experience I will explore other products from MCS. Good value in a real Guayabera shirt! I’m really happy that I found this store. I love my shirts on a hot summer day. They are comfortable, stylish and cool. Goes great with everything...dress it up or down. This is my second time ordering from this store and once again I'm a very satisfied customer!Perfect fit and fast delivery, thank you!